How to Use the Stampin’ Blends and How to Get them on Sale! Today’ I am going to show you how to use the Stampin’ Blends markers to achieve a soft, gradated or ombre look. I recently taught a class on how to use the Stampin’ Blends and I want to share that project with you. This example uses Pool Party Stampin’ Blend markers. See how the color is darker at the bottom of each letter and lighter towards the top? 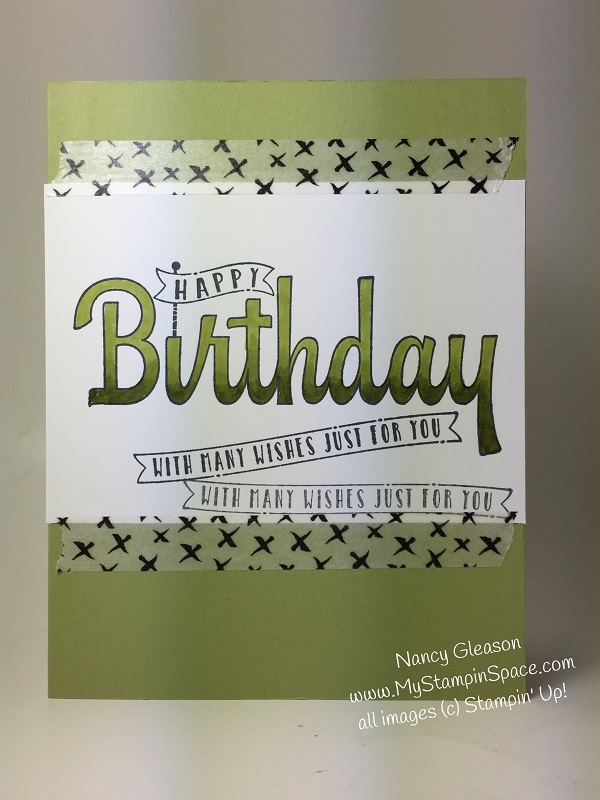 That’s the beauty of the Stampin’ Blends markers! 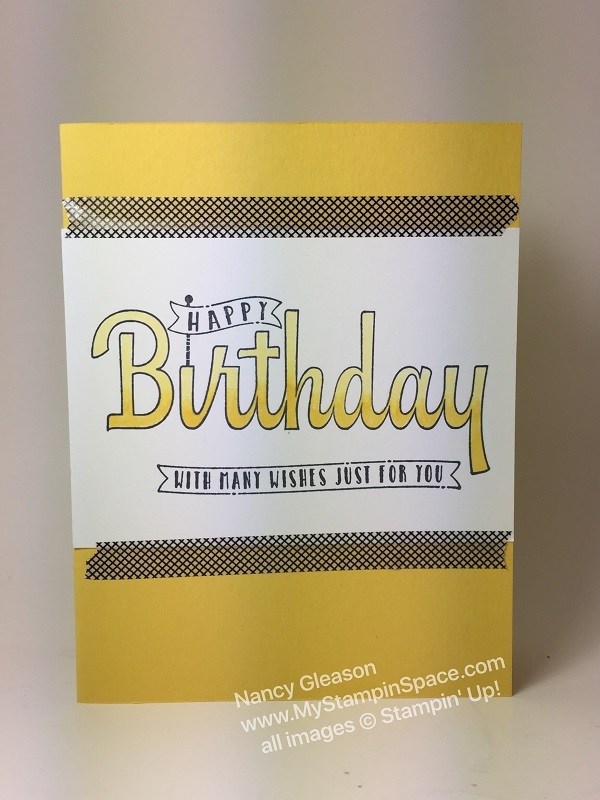 I used the Birthday Wishes For You, #145742 stamp for the Happy Birthday, and used the light and dark of each shade of color to get my results. 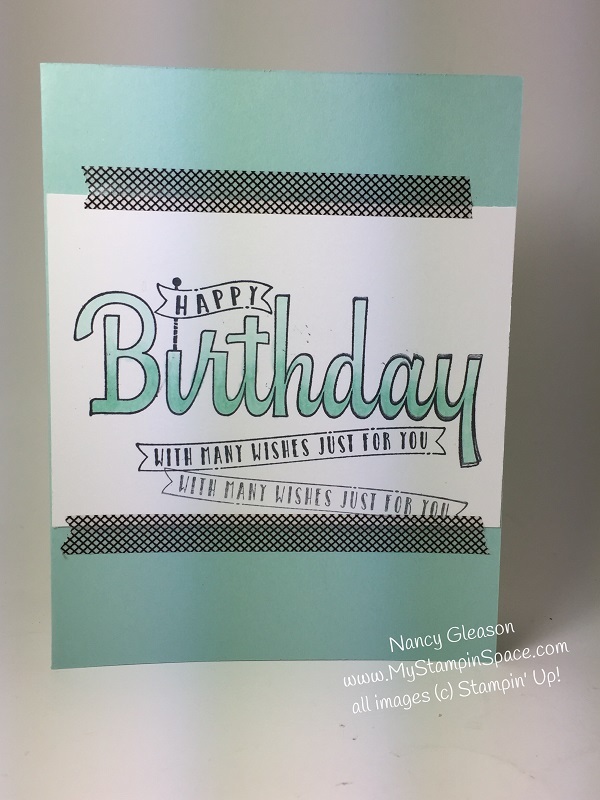 There are a couple of tips you should know about to get good results with the Stampin’ Blends. First, use the Memento Tuxedo Black Ink, #132708 to stamp the outline stamp. There are several stamp sets in our Annual Catalog, as well as the Occasions catalog that will work wonderfully with the Stampin’ Blends. Secondly, you need the light and dark version of each color. You will always want to color with a scrap piece of paper under the piece you are working on. The markers do bleed thru the cardstock and you don’t want to ruin your work surface. Do you have a favorite? I have to say that whatever color I was coloring at the time was my favorite; I love them all! This is a great stamp set to practice with the Stampin’ Blends as it very forgiving. I started with the dark shade at the bottom of each letter, working 2-3 letters at a time, then I went in with the lighter shade working from the top down. I overlapped the light shade over the ‘line’ where the light and dark met. This coloring back and forth across that line allowed the colors to blend so that the colors blended together, rather than having a hard line. I recently taught the ladies at my Wine Down Wednesday stamp class how to make this card. Everyone walked away with a card they were proud to show off, and loved the Stampin’ Blends! I’ll be showing a more detailed image colored with the Stampin’ Blends later this week so make sure you come back to see that. In the meantime I wanted to share with you how you can get Stampin’ Blends for yourself. 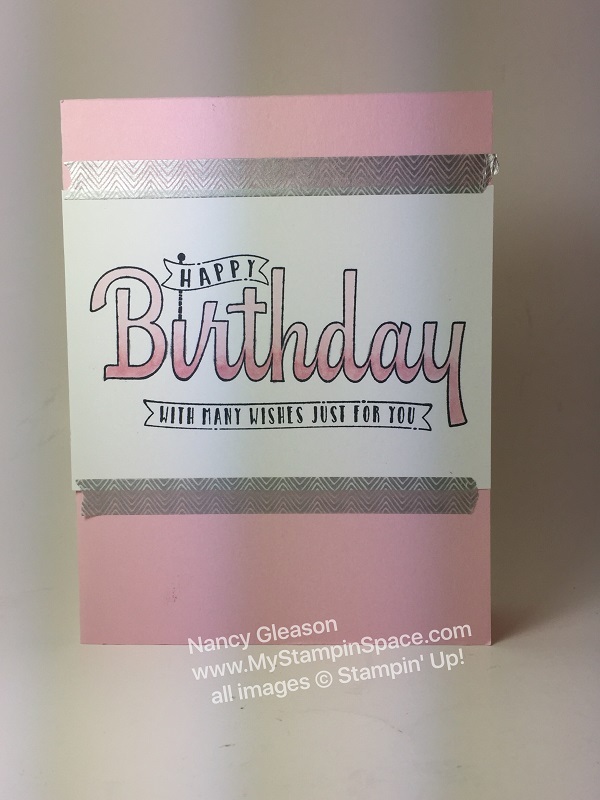 what’s the best way to get stampin’ blends? You can buy the markers individually for $4.50 each or $9.00 for the set of Light and Dark shades of each color. There are 12 Colors plus a Bronze, and Ivory, and a Color Lifter pen for a total of 27 markers. You can purchase the Stampin’ Blends Marker Collection for $121.50 plus 10% shipping. Or you can purchase the Stampin’ Blends Collection for $99 and get free shipping. Which option will you choose? If you want to order the Stampin Blends Marker Collection for $121.50, or buy individual markers, CLICK HERE. If you want to get the entire set of 27 Stampin’ Blends markers for only $99, you can purchase the $99 Starter Kit. You get to choose $125 worth of products, and get free shipping. With this option you can elect to become a ‘wholesale customer’ or ‘hobby demo’. You can also choose to become a ‘business builder’. Either way you get the same perks and benefits and you get to enjoy the discount, the early catalog reveal and more. You’ll become part of my team, My Stampin’ Circle, too! I hope that you’ll take advantage of the $99 Starter Kit deal to get the complete set of Stampin’Blends as this is the best bang for your buck! Oh, and did I mention that you will also get to choose 2 FREE Stamp Sets (any value) when you purchase the $99 Starter Kit during Sale-A-Bration (thru March 31st)? Which 2 stamp sets will YOU choose for Free with YOUR starter kit? If you enjoyed the projects in today’s post please COMMENT HERE. I love hearing from you. If you have any questions, feel free to EMAIL ME. And don’t forget to SUBSCRIBE to my FREE monthly newsletter & exclusive offers. I hope you enjoyed learning How to Use the Stampin’ Blends Markers and how you can get them discounted by purchasing the $99 Starter Kit. ← A Valentine Project Tutorial Special just for you!